Data collected in electronic medical records for a patient in primary care can span from birth to death and can have enormous benefits in improving health care and public health, and for research. Several systems exist in the United Kingdom (UK) to facilitate the use of research data generated from consultations between primary care professionals and their patients. In a study published in the Journal of Innovation in Health Informatics, we carried out a bibliometric review to analyse the research outputs and the longitudinal growth in the number of publications that harness the three main UK primary care databases: CPRD, QResearch and THIN. 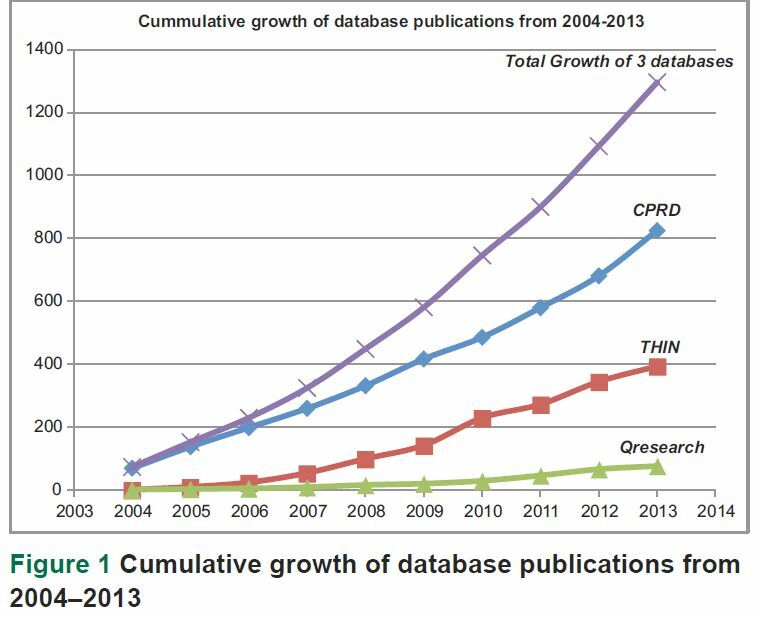 These databases collectively produced 1,296 publications over a ten-year period, with CPRD producing 63.6% (n=825 papers), THIN 30.4% (n=394) and QResearch 5.9% (n=77). Pharmacoepidemiology and General Medicine were the most common specialities featured. these databases for research that benefits the health of the population of the UK. Pay for performance programmes are being adopted in a growing number of countries as a quality improvement tool. In 2004, the United Kingdom introduced the Quality and Outcomes Framework (QOF) which primarily aimed to improve the management of common chronic conditions, such as diabetes and stroke, in primary care. The Department of Health in England is now considering allowing more flexibility in local pay for performance schemes, such as the introduction of higher payments for meeting tougher performance targets. Research carried out at Imperial College London suggests that such local pay for performance schemes can improve target achievement by general practices but have no significant impact on the overall quality of clinical care. The study was funded by the NIHR and the NW London Collaboration for Leadership in Applied Health Research and Care (CLAHRC) and published in the journal PLoS One. In the study, which was carried out by a team from the Department of Public Health and Primary Care at Imperial College London, the impact of a local pay for performance programme (QOF+), which rewarded financially more ambitious quality targets (‘stretch targets’) than those used nationally in the Quality and Outcomes Framework (QOF) was examined. The research team focused on targets for intermediate outcomes in patients with cardiovascular disease and diabetes. The team also analysed patient-level data on exception reporting. Exception reporting allows practitioners to exclude patients from target calculations if certain criteria are met, e.g. the patient has a terminal illness or gives informed dissent from treatment. The team found that the local pay for performance program led to significantly higher target achievements for the management of hypertension, coronary heart disease, diabetes and stroke. However, the increase was driven by higher rates of exception reporting in patients. There were no statistically significant improvements in mean blood pressure, cholesterol or HbA1c levels. Thus, achievement of higher payment thresholds in the local pay for performance scheme was mainly due to increased exception reporting by practices. This may have been because the patients who were not exception-reported would not have benefited from more intensive treatment. There were no significant improvements in overall quality of clinical care once exception reporting was taken into account. Hence, active monitoring of exception reporting should be considered when setting more ambitious quality targets for primary care teams. Some policy-makers and health service managers may consider giving practices less scope to exclude patients from pay from performance targets in an attempt to improve quality of care. Conversely, pay for performance programmes should not encourage over-treatment or inappropriate treatment; and exception reporting of suitable patients should always be allowed. Patients should also always be fully involved in decisions about their care and decide whether the incremental benefits of more intensive treatment will outweigh the potential problems (for example, from more intensive control of glucose in people with diabetes). The likely effects of the Conservatives’ and Labour’s pledges to improve access to primary care are unclear. Both main parties have promised large increases in the number of GPs and significant improvements in access to appointments. In an article published in the the British Medical Journal, Thomas Cowling and Matthew Harris and myself – from the Department of Primary Care and Public Health at Imperial College London – say the pledges are unlikely to be achieved within a single parliamentary term. The Labour Party have pledged to recruit 8,000 new GPs and plan to reintroduce their guarantee of an appointment within 48 hours. This target was far from being achieved under the last Labour government, with only 81 per cent of patients able to see a GP within two weekdays in 2009-10. As well as recruiting 5,000 extra GPs, the Conservatives have promised that if they are re-elected, patients in England will be able to see a GP between 8am and 8pm, seven days a week. This policy has been piloted in 14 per cent of GP practices, but results of an independent evaluation are yet to be published. The BMJ article discusses the aims of the parties’ pledges and looks at the evidence for how effective they would be. The largest increase in the GP workforce over any previous five-year period was 5,414, from 2004 to 2009. Last year, a GP Taskforce report identified major recruitment and retention problems that need to be tackled to increase GP numbers, including a shortage of GP training posts. Both Labour and the Conservatives claim that their policies will reduce attendance at A&E departments. Although some studies have found an association between GP access and lower rates of A&E visits and emergency admissions, there is a lack of evidence that improving access over time reduces the demand for other services. Although both parties appear to see access to primary care as a serious problem, we point out that international comparisons typically rate the UK highly, such as a recent assessment of 11 high-income countries that ranked the UK top for access to healthcare. Approximately 90% of patients in England were able to get a general practice appointment on their last attempt to do so, according to national patient survey data. The article received widespread coverage in media outlets such as the Independent, Sky News, Yahoo, Daily Mail and Newsweek. A study from Imperial College London reports that alternative providers of primary care in the NHS, including private sector companies, do not perform as well as traditional GP practices when their performance is assessed using a range of measures of quality of care. Alternative providers have been contracted to offer primary care in the NHS since 2004 under reforms designed to increase competition. These providers performed worse than traditional GP practices on 15 out of 17 indicators after adjusting for the characteristics of the practices and the populations they serve.The study was published in the Journal of the Royal Society of Medicine. “This study provides data to inform the debate about the growing role of the private sector in the NHS,” said Dr Christopher Millett, lead author of the study, from the School of Public Health at Imperial. “New providers were allowed into the primary care market to stimulate competition, but our findings suggest that their introduction has not led to improvements in quality and may have resulted in worse care. Three hundred and forty-seven general practices – 4.1 per cent of practices in England – are run by alternative providers, including private companies and voluntary organisations. These practices tend to be smaller, and serve younger, more diverse and more deprived populations than traditional providers. The study looked at a range of performance indicators from the Health and Social Care Information Centre and the national GP Patient Survey. These included access measures such as how easily patients can get appointments, clinical measures such as how well they manage patients’ blood pressure, and efficiency measures. Among the differences between types of practices, alternative providers had worse results for patients’ diabetes control, higher hospital admission rates for chronic conditions, and lower overall patient satisfaction. The article was covered by a number of media outlets including the Independent, Pulse, Daily Mail, BMJ, GP Online, BT.Com and OnMedica. An article from my research group examined coverage of the NHS Health Check programme in England. The article was published in the journal Preventive Medicine. We found that coverage of the programme was low in the first four years and there was a wide variation in coverage between general practice. There was an increase in statin prescribing but only about one in three people who attended for a Health Check and who were found to have a cardiovascular risk score (20% or more 10-year risk of cardiovascular disease) were prescribed a statin. We concluded that unless coverage of the NHS Health Check programme improved and uptake of statins in high-risk groups increased, the programme would not deliver its predicted benefits in reducing morbidity and mortality from cardiovascular disease. The article was covered by a number of media outlets including the Daily Mail and Pulse. What does the future hold for CCGs? One of the key aims of establishing clinical commissioning groups (CCGs) in England’s NHS was to place general practitioners at the heart of NHS commissioning. And yet surveys consistently show that many GPs feel that their view are ignored by their CCGs. For example, an NHS England survey reported that only 44% of GPs said that their CCGs acted on their views. A BMA survey reported that nearly two-thirds of GPs feel they either had limited influence on their CCGs or that they were dictated to by their CCGs rather than being asked to contribute to CCG decision making. Another key aim of creating CCGs was to make use of GPs’ clinical expertise in commissioning health services to improve health outcomes and patients’ experience of the NHS. However, a Pulse survey found that more than twice as many GPs think that the introduction of CCGs has been detrimental to patient care than think have improved it. In many ways, the fate of CCGs is linked with inextricably the consequences of the 2012 Health and Social Care Act that created them. The disruption caused by the changes the Act brought about, at a time when the NHS was entering a period of unprecedented financial pressure, have clearly made it difficult for both GPs and CCGs to function effectively. One example of this was the transfer of key public health functions to local authorities – rather than to CCGs – when primary care trusts (PCTs) were abolished. GPs suddenly found themselves with little or no influence in determining local policies for services in areas such as smoking cessation and sexual health. Many GPs have worked very hard to try to ensure that CCGs delivered what they set out to do when they were established. They will argue that the financial pressures on the NHS – and the declining share of the NHS budget spent on primary care along with the large increase in workload that primary care teams have experienced in recent years – that are largely responsible for the perception among many GPs that CCGs have failed to achieve their key objectives. But it is CCGs who now control the majority of NHS funds in England and they could have done more to protect and expand primary care services, and taken a stronger line against the demands of NHS hospital trusts. What does the future hold for CCGs? The former Chancellor, George Osborne, stated that major cities in England will be offered the opportunity to control their health budgets. GPs were not consulted about this proposal which will effectively remove from many CCGs much of the influence they currently have in commissioning NHS services. Other CCGs have opted to take on the co-commissioning of primary care services in addition to secondary care commissioning, effectively recreating PCTs (but still without responsibility for key public health functions). To prevent conflicts of interests, the role of GPs in CCGs that take on co-commissioning will have to be carefully regulated. Other CCGs have begun to merge their commissioning functions, thereby creating much larger organisations. Hence, in many parts of England, we will start to see the end of GP-led commissioning. GPs will continue to have a role in commissioning health services but increasingly this will be an advisory rather than a leadership role. A version of this article was first published in Pulse. In an article in the medical magazine Pulse, I and two other commentators discuss issues around the electronic sharing of images of patients that clinicans should be aware of. The very high use of information technology in modern society has resulted in the practical uses of sending and sharing information electronically rapidly outstripping published guidance in this area. For example, many NHS organisations have draconian policies about sending patient information by email – in some cases describing sending information by unencrypted email as similar to ‘sending it on a postcard’. No empirical evidence is ever presented in such guidance that sending information electronically is any less secure than sending it by post or telephone. Guidance from such organisations has also yet to catch up with the now near-ubiquitous access to smartphones, high-speed Internet connections and high-resolution cameras in our society. In my opinion, it is acceptable for the photo to be stored on your phone as long as you take reasonable precautions to secure your device. Most patients would generally be happy to have an image of their skin condition shared with your colleague if this helped in getting a better diagnosis or a more appropriate treatment plan. You should though obtain consent from the patient before sharing the image with your colleague. If you are apprehensive about using a photo or file sharing app, you could send the image from one NHS Net email account to another. NHS email is a fully encrypted method of communication and can be used for sending sensitive patient information. If you want to use the image in a presentation, then you should get explicit consent for this from the patient, ideally in writing, as is now standard for case reports in medical journals. We should encourage the use of technology as a tool for improving quality of care, patient experience and health outcomes; but at the same time, we must ensure that we respect patient confidentiality and always obtain informed consent from patients before sharing their information electronically. You can read the full article in Pulse. Timely diagnosis and management of heart failure (HF) is critical, but identification of patients with suspected HF can be challenging, especially in primary care where patients can present with a range of symptoms of varying severity. In a paper published in the journal Heart, we describe the journey of people with HF in primary care from presentation through to diagnosis and initial management. We used the Clinical Practice Research Datalink (primary care consultations linked to hospital admissions data and national death registrations for patients registered with participating primary care practices in England) to describe investigation and referral pathways followed by patients from first presentation with relevant symptoms to HF diagnosis, particularly alignment with recommendations of the National Institute for Health and Care Excellence guideline for HF diagnosis. 36 748 patients had a diagnosis of HF recorded that met the inclusion criteria between 1 January 2010 and 31 March 2013. For 29 113 (79.2%) patients, this was first recorded in hospital. 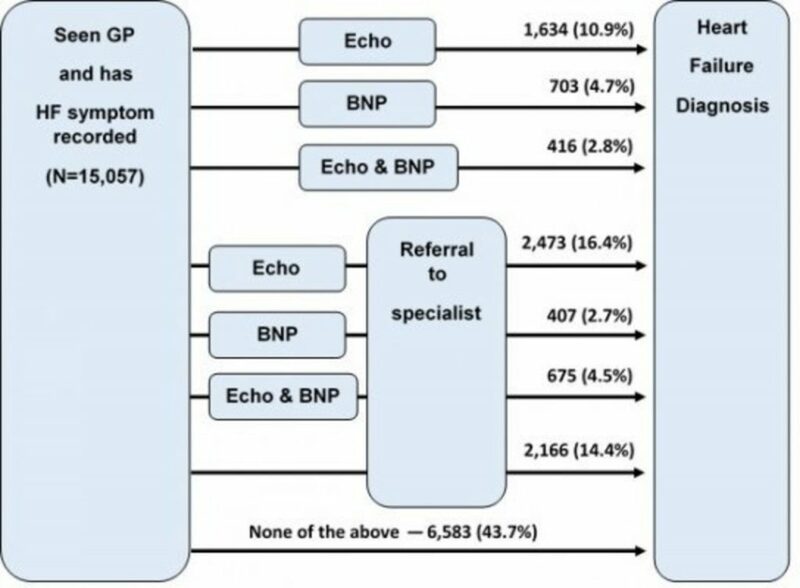 In the 5 years before diagnosis, 15 057 patients (41.0%) had a primary care consultation with one of three key HF symptoms recorded, 17 724 (48.2%) attended for another reason and 3967 (10.8%) did not see their general practitioner. Only 24% of those with recorded HF symptoms followed a pathway aligned with guidelines (echocardiogram and/or serum natriuretic peptide test and specialist referral), while 44% had no echocardiogram, natriuretic peptide test or referral. We concluded that patients follow various pathways to the diagnosis of HF. However, few appear to follow a pathway supported by guidelines for investigation and referral. Although there are likely to be missed opportunities for earlier HF diagnosis in primary care, it is also the case that it can be difficult to condense the management of conditions that present in complex ways in primary care using simple linear guidelines. Bariatric surgery – Should we prioritise patients with type 2 diabetes? The results of recent research studies illustrate the importance of prioritizing obese people with type 2 diabetes mellitus when it comes to selecting patients for bariatric surgery. For example, the number of people eligible for bariatric surgery in England far exceeds the bariatric surgery capacity of its National Health Service. If the aim of bariatric surgery is to reduce mortality and morbidity among obese patients, then the focus should be on selecting patients for surgery based on the presence of the conditions that have the greatest detrimental effect on health status. It may therefore be appropriate to reconsider the importance of body mass index alone as a predictor of mortality and put more emphasis on the presence of comorbidities when assessing eligibility for bariatric surgery. Given the significant benefits for people with type 2 diabetes that bariatric surgery offers and the resulting major improvements in their health status, there is a strong case that type 2 diabetes should be considered as the preferred comorbidity when selecting patients for surgery. The full letter can be read in JAMA Surgery. Children and adults with gender identity concerns are increasingly presenting for treatment, with referrals to specialist clinics rapidly rising. The percentage of children with gender identity disorder that self-harm or attempt suicide is estimated at 50%, so it is essential that it is recognised early and managed appropriately. Gender identity disorder of childhood usually manifests before puberty. The child typically experiences distress resulting from an incongruence between their current gender identity (sense of themselves as ‘male’, ‘female’, or otherwise), and their gender assigned at birth. Behaviour and activities of the child may stereotypically be associated with that of the opposite gender and the child may be preoccupied with wanting to change their name and gender pronoun (‘she’, ‘he’). Depending on the age, they may also have a strong desire to acquire secondary sexual characteristics of the opposite gender. This may cause significant distress and can impact their performance and experiences at school or at home. Six months of persistent gender non-conforming behaviour has been proposed as an indicator that this is more than ‘a phase’, which is common and not necessarily pathological for many individuals in childhood. Tom is 13 years old and has come with his mother to see you. She tells you he becomes distressed when people address him as Tom, and asks to be called Kelly. He hates wearing boys’ clothes, and most of his friends at school are girls, leading to teasing about him being ‘gay’. Recently, his mother found a skirt in his room, which he eventually admitted to having stolen from a friend’s house. He has asked his mother if he can ‘become a girl’, and seems so preoccupied with this idea that he is struggling to complete his school homework. Today Tom’s mother wants to know what to do. The full article can be read in the journal BJGP Open.